The Winterburn Woodland natural area is one of the largest retained tableland forest patches within the urbanized areas of the city. 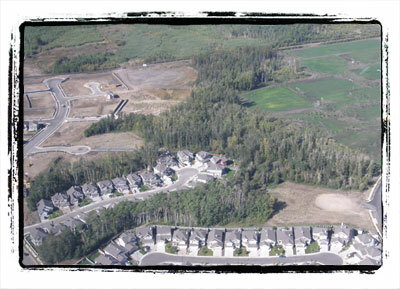 This natural area boasts a wonderful diversity of plants that is among the best of any upland site in Edmonton. The richness of the area allows white spruce to grow at excellent rates where the canopy can reach heights of 18 m. The diversity and richness of this site combine to create excellent habitat for deer, small mammals, and birds. Because this site is just east of the forested region of the Stony Plain Indian Reserve, it acts as an important corridor for wildlife moving between the reserve and natural areas in Edmonton. In addition to the many animals attracted to the unique features of this site, many people use this site for a variety of outdoor recreational pursuits. portions of the natural area. 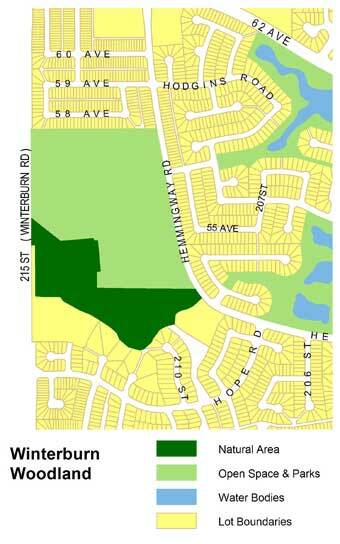 The Winterburn Woodland natural area is located in the Hamptons Neighbourhood between 215 St. (Winterburn Rd.) and Hemmingway Rd. Formal trails allow access to the treestand from a number of locations including the north side of Hope Rd. between 209 St. and 210 St., and the end of cul-de-sacs along 210 St. and 212 St. Access is also provided to the north portion of the natural area from the school site located immediately north of the treestand (accessed via Hemmingway Rd.). The size of this natural area and its close proximity to the Stony Plain Indian Reserve enable this site to sustain many different types of wildlife including deer, small mammals and an excellent variety of bird species such as woodpeckers, sapsuckers, hawks, flycatchers, wrens, vireos and many more. A diversity of vegetation communities within the treestand adds to the diversity of both plants and animals that can be seen here.